One of the great thrills of working in the Europe-Middle East Church of God is seeing how many young leaders are emerging that are committed to stay with the Church of God in the future. Though the Three Worlds Leadership Network (3WLN), young pastors and others between the ages of twenty and forty-five who are working for the church can stay in contact with each other, do ministry together, and be a source of encouragement and synergy. At our latest 3WLN, our newest pastor couple were Nick and Suellen Lovaglio, who have answered the call together to ministry in Treviso, Italy. Nick (Nicola) grew up in the Church of God and is the son of Pastor Nicola Lovaglio and his wife Bertha. His father was an Italian missionary from the Church of God that was influential in starting many churches in the country of Venezuela, where Nicola and his brother Marcos were born. 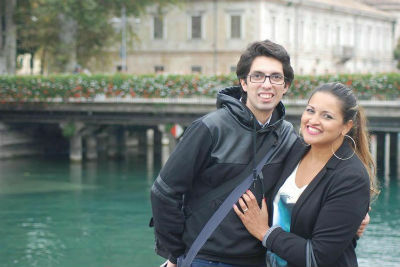 Marcos and his wife Katherine serve as pastors at the growing, youthful church in Arco, Italy. There Marcos has developed an outstanding team of young leaders in ministry. Nick, age thirty, plays violin and was involved in another church with a band when he felt the Lord was calling him to assume leadership at the Treviso Church of God. Established nearly seven years ago, the Treviso church was finding itself needing to re-start and re-adjust often. Nicola and Suellen could see that the church would need to re-configure itself a bit to begin reaching Italians who are very suspicious of evangelical Christianity. One of the first changes was moving the service to Sunday morning as the traditionally Catholic people had a hard time conceiving of church in the evening. This meant making sure a facility could be rented on Sunday mornings, which they recently secured. Many young pastors in Europe are seeing that they have to do ministry in a completely different way to truly reach Europeans, as opposed to immigrants that are already Christians. Nick, who has a heart for mentoring, is a skilled carpenter highly valued by his company. His hope is to mentor many in the ways of the Lord. As is common with many of our young European leaders, they don’t care about being the big boss or accruing power in the church. This is so refreshing! They are all committed to investing in the next generation in the same way the 3W team invests in them. Suellen, who studied at the University of Venice, is a wedding planner and has a tremendous gift for hospitality. This is something that can be used greatly for ministry as a team from LifePoint Church of God in Goshen, Indiana, recently found out when they had an amazing Brazilian barbecue dinner hosted and prepared by Suellen and her family. Every meal included a special violin performance from Nick, which always adds something very special to the evening. Nick and Suellen are extremely happy to be connected to the Church of God movement and to 3WLN. Ministry is extremely lonely in Europe and they do not feel adequately prepared for such a huge job. They are taking courses in theology and asking for the Three Worlds team and others to come alongside and support them. Both are very humble and open to learning. We are excited to see what God does through this young couple in Treviso, just a few miles north of Venice, Italy. Pray for Nick and Suellen and support 3WLN, which is creating a wonderful support system for young pastors in Europe and the Middle East. YOU can be a part of what God is doing in Italy. Donate online at http://chogglobal.org/mission-projects/projects-europe-middle-east/italy-expansion/ or mail your donation to Church of God Ministries, PO Box 2420, Anderson, IN 46018. Be sure to write Project 42.40530 on the memo line. Patrick and Jamie Nachtigall serve as regional coordinators for Global Strategy in Europe and the Middle East. This entry was posted in All Church of God, Global Strategy and tagged 3W, 3W Leadership Network, 3WLN, Europe and the Middle East, Europe-Middle East, Italy, leadership, Nick and Suellen Lovaglio, Patrick Nachtigall, Three Worlds, Treviso Church of God, young leaders. Bookmark the permalink.